This is the fourth in a series of posts on DIY wedding photo ideas. For a roadmap of the series, read the overview on DIY wedding photo ideas. Or go to the main DIY Wedding Guide. 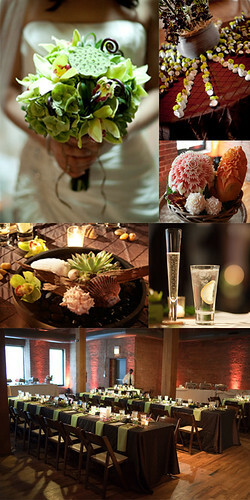 As I mentioned in my prior post, our wedding theme was “modern organic” or “natural modern”. Our wedding reception decor featured shells, branches, moss, succulents, green cymbidium orchids, large monstera leaves, black river rocks, and other natural elements and our colors were a dark chocolate brown and shades of green. It happened that a lot of the trips my husband and I took together while we were dating were to a lot of places with natural beauty, such as Joshua Tree National Park, Saguaro National Park and the shell covered beaches of Sanibel, Captiva and Naples, Florida. As you probably guessed, I took lots of photos. Most of them were taken with my trusty 5.1 megapixel Sony Cyber-shot T7 – a great little camera my family gave me for Christmas sometime in 2005. Photos of desert sunsets, prickly cacti, crashing waves, shell laden beaches and other natural landscapes fit right in with our theme. 2) I used a photo-editing program (Adobe Photoshop) and created a very simple template. If you don’t have Adobe Photoshop, no worries – I’ve used Microsoft Word to do simple layouts before. You can also get a free trial of Adobe Photoshop Elements. 4) Once you create your main template or layout, reuse the same layout and just replace the photos. 7) Regardless of what theme you may pick for your custom table numbers, even if you use a title like “Joshua Tree” and want that table known as the Joshua Tree table, you should pair it with a number. Depending on your lighting, names may be hard to read and you want your guests to be able to easily find their tables – a number is a lot easier to make out then a title. 8) I made sure to let the event staff know to try to collect as many of the table numbers as they could find at the end of the night. Don’t be surprised if guests like your custom table numbers so much that they take them home with them! 9) For a neat wall display for your new home, consider removing the photos from their stands and mat or frame your table numbers for an eye-catching display. I spent a bit more on the print quality cause I knew they would have a new life after the wedding! Wedding decor and home decor all in one! 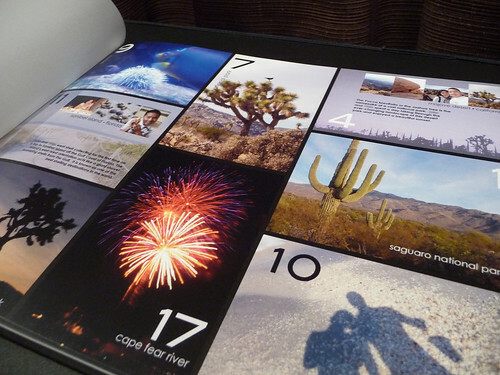 10) Oh and don’t forget to include your fabulous photo table numbers in your wedding photo book of course! Check out my DIY guide to wedding photo ideas and other posts related to Weddings & Brides. Interested in making your own photo book? Check out our Coupons and Deals page for discounts. Try out a neat NEW tool to help you find the right photo book publisher for you, our Photo Book Software Wizard!